Low Carbohydrate diets actually have a lot of misconceptions. So we’re going to go through a bunch of them. Let’s start out with the first two I hear most commonly. The first misconception: Ketosis is dangerous. The second misconception: Low carb diets make you lose bone mass and are bad for your kidneys. Ketosis just means you have ketones in your bloodstream. We have ketones in our bloodstream all the time. It’s just the level of ketones. Ketones are really just an energy source. They come from the breakdown of fat. Isn’t that what you want in a weight loss plan? You want to have some ketones in your bloodstream so you can use them as an energy source. Ketosis is often confused with diabetic ketoacidosis, and that’s a completely different thing. That occurs when the ketones get about 10 times the level of what would happen in a low carbohydrate diet. Ketosis by itself is not dangerous at all. It’s just an energy source. Initially in low carb diets we saw that there was some extra calcium in the urine. But long-term we found that we actually absorb more calcium. So for a little bit of calcium that’s lost in the urine, there’s still a positive calcium there. We don’t actually lose bone mass. We can actually improve bone mass. Kidney failure doesn’t happen. There’s a difference between kidneys that can have low carb diets and kidneys that shouldn’t have low carb diets. What I mean is, with kidneys that are normal, there’s no problem with having a low carbohydrate diet. Kidneys that are abnormal should not be on a low carbohydrate diet. Typically, on a low carbohydrate diet, you’re going to have a little more protein, and it’s the protein that’s the problem. It’s the extra nitrogen in protein that kidneys can’t handle if you’ve got bad kidneys. If you have normal kidneys, it could actually improve kidney function. Remember-it’s your life. Make it a healthy one! This entry was posted in Weight Loss Nutrition, Weight Loss Tips for Success and tagged #low carbohydrate diet, bariatric center of excellence, bariatric surgery, bariatrician, bone mass, Center for Weight Loss Success, CFWLS, Doc Weight Loss, dr thomas w clark, gastric sleeve, high protein diet, keto diet, ketosis, kidney problems, low carb diets, sleeve gastrectomy, weight loss newport news, weight loss surgery, weight loss virginia on April 15, 2019 by CFWLS. It’s often thought that low carbohydrate diets are only good for short term weight loss because they cause you to lose water. Isn’t that bad?? Yes it is good for short term weight loss is because you lose water. The reason you lose water is because insulin levels will go down on low carbohydrate diets. Insulin is a hormone that tends to make you retain sodium. When you retain sodium, you’re going to retain water. So, when insulin levels go down on a low carb diet, you no longer will retain sodium. Subsequently you’re going to get rid a lot of that extra water that goes along with the sodium. One of the nice things about that is you can actually have a little bit of extra sodium because you won’t retain it. So, yet, you will lose weight fairly quickly on a low carb diet because you lose some water weight. But you’re also losing fat. This entry was posted in Weight Loss Nutrition, Weight Loss Tips for Success and tagged #low carbohydrate diet, #surgical weight loss, bariatric surgery, Center for Weight Loss Success, center of excellence, CFWLS, Doc Weight Loss, dr thomas w clark, low carb diet, low carb living, water weight, weight loss expert, weight loss newport news, weight loss surgeon, weight loss surgery, weight loss virginia on April 8, 2019 by Dawn Olson. It’s no secret that eggs pack a great little protein punch and are extremely versatile in your diet. They average about 70-80 calories and contain 6-7 grams of protein. They are rich in choline, which helps promote normal cell activity and aids in the transportation of vitamins and minerals through your system. Eggs contain all 9 of the amino acids that are essential to your diet. What don’t they do? They don’t add to your carb count! 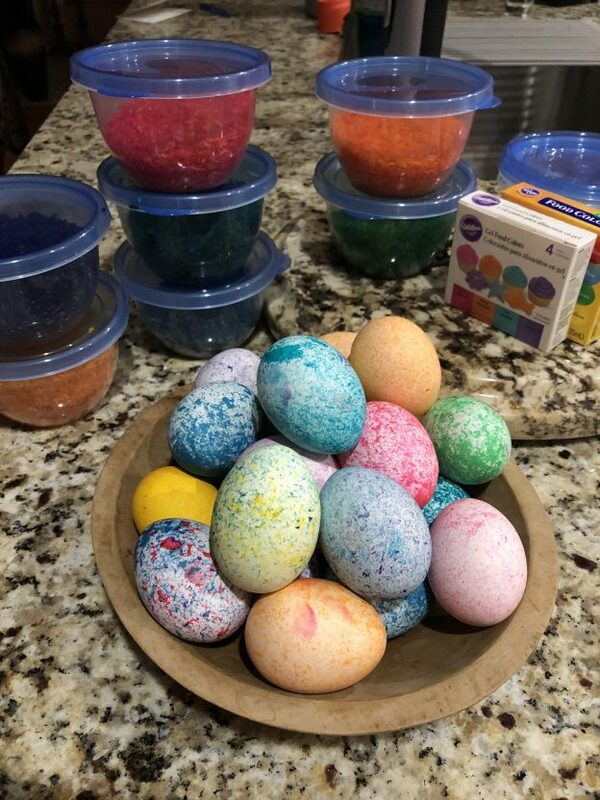 This time of year, you’ll see eggs everywhere – have you colored a batch yet? (You don’t need a child’s help but it could make it more fun). Pick up a dozen – or two – and make your own this weekend! We made a batch last weekend with this no-mess trick that’s great for little fingers. 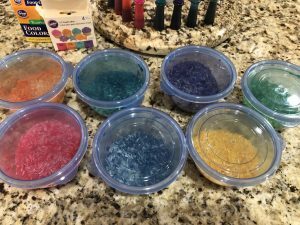 You’ll need a bag of rice and some basic liquid food coloring along with a number of small plastic containers with tight-fitting lids. 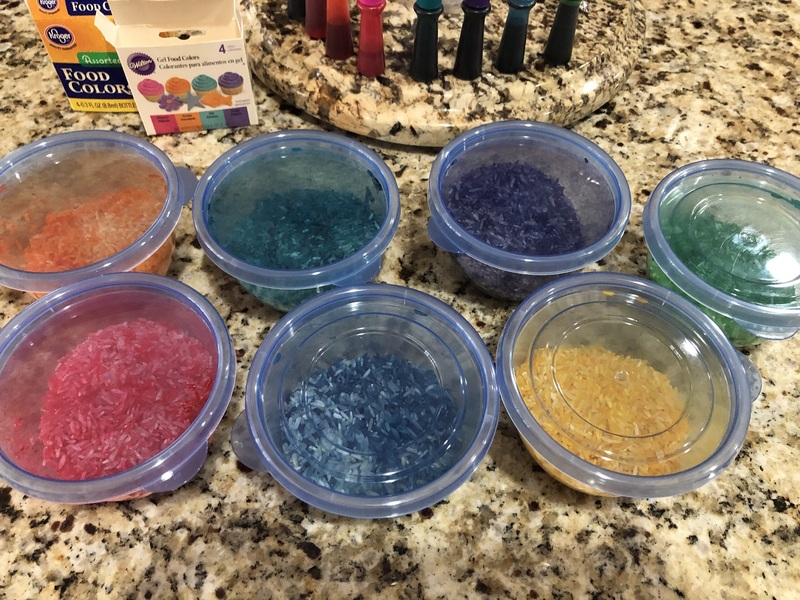 I picked up the rice & containers at the local dollar store. 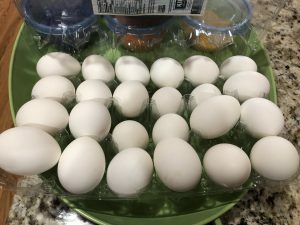 Start with this great tip on cooking the perfect hard-boiled eggs. Allow them to cool and dry completely. 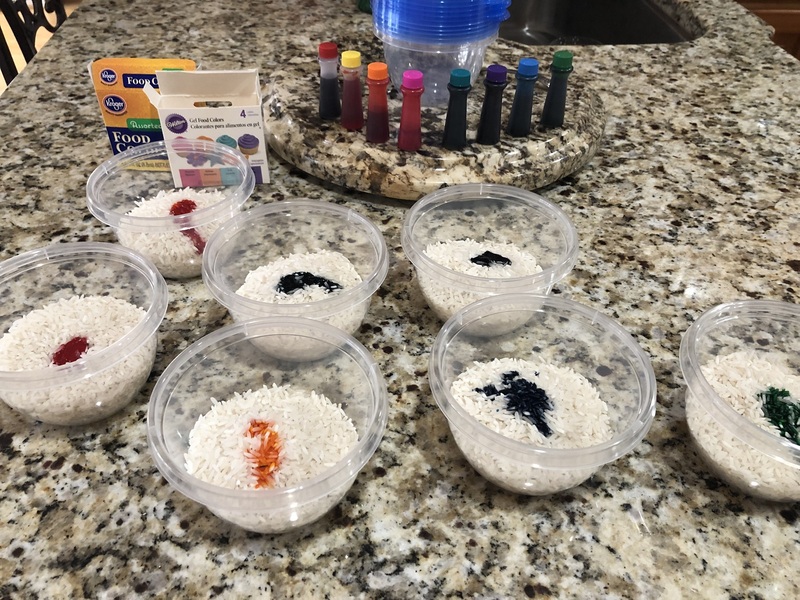 Put about 3/4 – 1 cup of rice to each container and add 8-10 drops of coloring to each cup. Shake the container to distribute the coloring to the rice. Open the container and add a hard boiled egg, reseal and hand to a small child to shake! 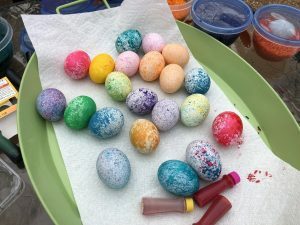 Remove the colored eggs from the cups and lay on a paper towel to dry completely. You can make them multi-colored by tossing them into a second color. 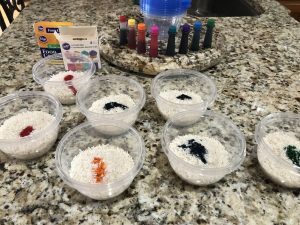 If the rice seems to be drying out, add a few more drops of coloring and shake before adding a new egg. Enjoy these colorful treats & Happy Easter everyone! 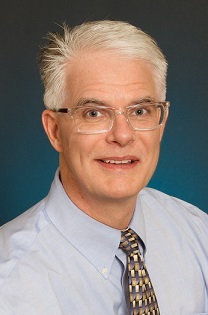 This entry was posted in Recipes, Uncategorized, Weight Loss Tips for Success and tagged bariatric center of excellence, bariatric nutrition, Center for Weight Loss Success, dr thomas w clark, easter eggs, eggs, fun with eggs, low carb, quality protein on April 5, 2019 by Dawn Olson. Long-term weight loss is achieved through permanent changes in your lifestyle and food choices, not through fad quick fix diets or pills. 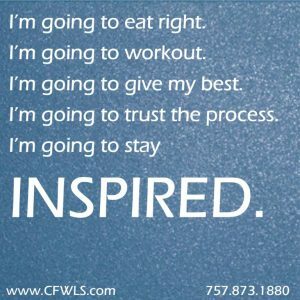 Before beginning on your weight loss journey, make a commitment to your health and stick with it! Regular exercise is a critical component of permanent weight loss. We recommend a minimum of five 30-minute sessions per week. Read our exercise tips on this blog for ideas on how to stay motivated and enjoy your exercise routines. Remember that drastic weight loss in a short amount of time is not healthy, and it is more likely the loss is coming from water and muscle, not fat. Fat loss is best achieved when weight is lost slowly. Strive for a weight loss of no more than 1-2 pounds per week. An important factor of long-term weight loss is the support and encouragement from others, whether it’s from your doctor, nutritionist, family or friends. Connecting with others helps you stay motivated, learn tips and techniques, and keep focused on your weight loss goals. If you’re not already a part of our private Weight Loss Surgery Support Group on Facebook, request to join now! Any patient that is 2 weeks or more post-op will be approved to participate – it’s a fantastic group of people! This entry was posted in Non-Surgical Weight Loss, Weight Loss Fitness, Weight Loss Nutrition, Weight Loss Surgery, Weight Loss Tips for Success and tagged #surgical weight loss, bariatric center of excellence, Center for Weight Loss Success, center of excellence, dr thomas w clark, gastric sleeve, long term weight loss, nonsurgical weight loss, sleeve gastrectomy, weight loss hampton roads, weight loss newport news, weight loss success, weight loss support group, weight loss surgery, weight loss tips, weight loss virginia on April 2, 2019 by CFWLS. Do Fat Blockers Really Work? Fat blockers are out there. You’ll see them on the internet. You can buy them over-the-counter. Do they work? Can they be helpful a weight loss plan? The short answer is potentially they really can be helpful. What are fat blockers? There are two different fat blockers out there. They’re the same generic medication called orlistat. Orlistat can be found over-the-counter as Alli. It also can be sold in prescription strength as Xenical. They’re the same thing. But what they can do is block 25%- 1/3 of the fat that you eat. By doing that, it can decrease the amount of calories that are absorbed. You have to be very careful because if you’re not absorbing that fat, it’s going to run through you. Potentially, fat blockers can cause significant gastrointestinal problems. You might get bloated or have cramping. Eventually, it’s coming out the other end. If you eat too much fat it might be coming out the other end sooner than you thought. So, you’ve got to be careful. But it can be helpful. If you’re doing the right things like a good diet and exercise, cutting back on fat can decrease some of the calories you’re eating. Remember, it’s your life! Make it a healthy one! This entry was posted in Non-Surgical Weight Loss, Weight Loss Tips for Success and tagged #surgical weight loss, alli, bariatric medicine, bariatric surgery, bariatrician, Center for Weight Loss Success, cramping, Doc Weight Loss, dr thomas w clark, fat blockers, lipase inhibitor, medical weight loss, nonsurgical weight loss, orlistat, side effects, weight loss surgery, xenical on April 1, 2019 by CFWLS. One thing that is inevitable during your weight loss journey is a weight loss plateau. This is very frustrating and often results in a setback or response such as “Why am I working so hard when I am not seeing progress?” If you don’t understand how to manage a plateau and actually believe this statement, it can be a recipe for disaster! You must not take an expected plateau and turn it into a big relapse or an excuse to abandon all weight loss efforts! 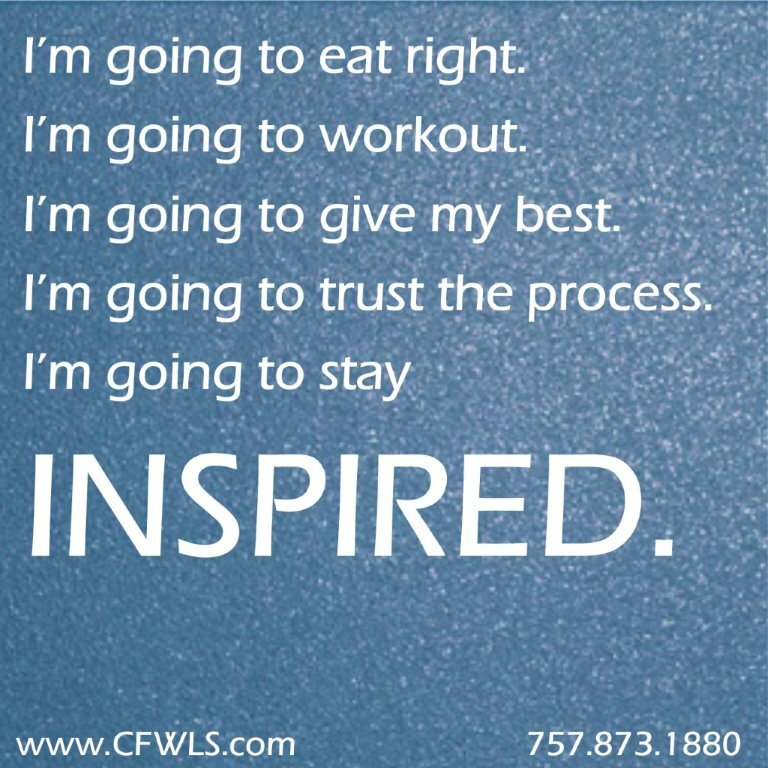 Instead, follow these suggestions to keep you moving in the right direction- towards the health goals you desire and deserve. First, if you haven’t been exercising – START! 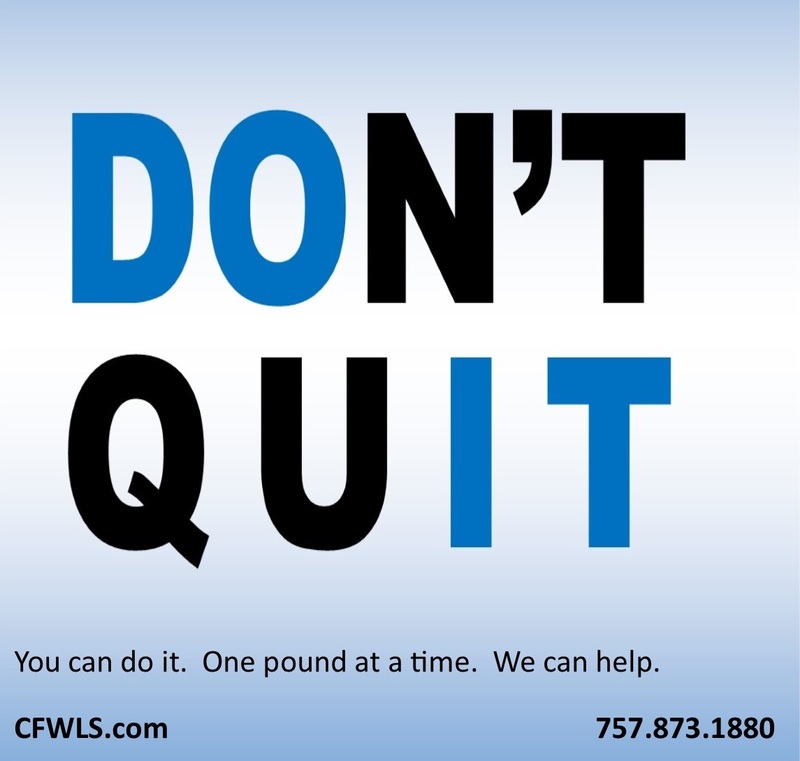 If you aren’t sure how to start, there are many resources available to you – contact one of our experts at the Center for Weight Loss Success to set up a program that is safe and will work for you, start a walking program with a friend or join an exercise program at a local gym. If you have incorporated exercise into your daily routine – GREAT JOB – it’s just a matter of shaking it up a bit. Follow the FIT ideas we promote at CFWLS. You can change the Frequency (i.e. exercise 4 times a week instead of 3), Intensity (i.e. add some hills to your walking program), or Type (add resistance training or swim instead of walk) of workout you perform. All of these will challenge your muscles and potentially increase your lean body mass and improve your metabolism. Second, modify your eating. Change your meal frequency, make sure you are getting in enough calories and make sure you are eating enough lean protein and controlling your carbohydrate intake. Journaling is a great way to track what you are eating in order to identify key areas that require modification. A weight loss coach can be key in identifying areas of concern and developing a realistic plan to keep your weight moving in the right direction. The Baritastic app is free and makes it easy & fun! Finally, don’t forget your weight loss personality and how it may affect how you handle a plateau. If you tend to be impulsive, you might see a tempting food and grab it so it is important for you to remove temptations. You may eat mindlessly. In this instance, you need to set limitations for availability of food while reading or watching TV. Decide only to eat at the table and limit snacks. Some of us eat because we are anxious, nervous or depressed. Recognize your emotions and find something you enjoy doing such as listening to music or reading a good book. Keep your weight loss goals in mind and have a vision of success. Your mind is a very powerful tool so you need to use it to achieve success. This entry was posted in Weight Loss Tips for Success and tagged #surgical weight loss, bariatric center of excellence, bariatric medicine, bariatric surgeon, bariatric surgery, bariatrician, Center for Weight Loss Success, center of excellence, dr thomas w clark, gastric sleeve, sleeve gastrectomy, weight loss plateau, weight loss success, weight loss surgery, weight loss tips, weight stall on March 25, 2019 by CFWLS. Tired of fighting fatigue? What do you normally reach for when you feel sluggish or lethargic? ‘Something to eat’ is not the best answer. 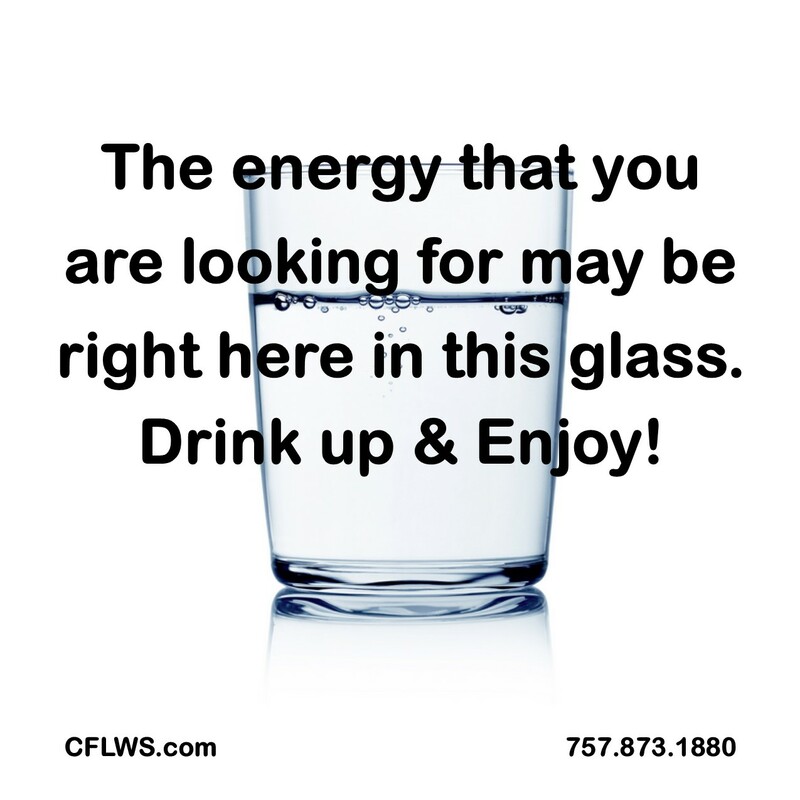 Now, if you had said a tall glass of water or even a pillow, you would be on the right track! Hydration and Rest are vital for your health and well-being. They are two of the key ingredients to feeling and performing your best. Staying hydrated will keep you energized and may help you shed weight–even mild dehydration can slow metabolism. 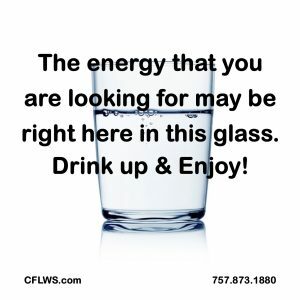 Every single cell in your body needs water. Water transports nutrients and oxygen to your body cells and removes waste products. We recommend that you avoid drinking too many artificially sweetened beverages. Even though they are low in calories, they may interfere with your brain’s signals, prompting you to eat more. If you don’t like the taste of plain water, try adding sliced citrus fruits or cucumber for some flavor. Drinking enough fluids is one of the simplest ways to keep energized and stay focused. A study of healthy individuals found that 92% felt fatigued after limiting fluids and water-rich foods for 15 hours; they also had lapses in memory and reported difficulty concentrating. When it comes to maintaining your energy, select meals and snacks that are rich in water, such as fresh produce or protein drinks. The average person loses about 10 cups of water through daily activities. Your actual needs will vary based on climate, diet and activity. Have you replenished your system today? Sleep, or more likely the lack of it, is sometimes responsible for our lack of energy. Your body counts on being able to restore balance to your hunger hormones and other systems as you sleep each night. When this doesn’t happen, your ghrelin and leptin stores may not be providing the proper signals to your brain, causing you to overeat. You have probably noticed that it’s harder to make good choices when you’re tired. You may talk yourself out of going to exercise class or taking a walk when you get home from work. Dinner may sound like too much of a chore and you find yourself at your old drive-through favorite. Establish a regular sleep schedule. This will strengthen your body’s circadian rhythm and help you get the rest that you need each night. Don’t let your defenses get down. Arm yourself with plenty of water and a good night’s sleep. You’ll be ready to take on the day! Subscribe to Losing Weight USA for Dr. Clark’s weekly advice & tips for losing weight! This entry was posted in Weight Loss Tips for Success and tagged #surgical weight loss, bariatric surgery, Center for Weight Loss Success, center of excellence, dr thomas w clark, fighting fatigue, h2o, metabolism, nonsurgical weight loss, rest, water, weight loss expert, weight loss hampton roads, weight loss newport news, weight loss tips, weight loss virginia on March 11, 2019 by CFWLS. I want to complete the video I made last week which was about routine weighing. Should you weigh yourself routinely or not? My inclination is, yes, people ought to weigh themselves regularly. I think people should weigh themselves daily. I want to talk about what the real reason is for weighing yourself daily. Especially if you’re in a weight loss program, whether you’ve had surgery or you’re in the middle of a weight loss plan, I encourage people to weigh themselves daily. During the weight loss program, you’re not just weighing yourself to watch the pounds come off. The real reason to weigh daily is to get in the habit of weighing yourself routinely for maintenance. Maintenance is hard. It’s actually harder than weight loss. So, you want to get in the habit of weighing yourself routinely during the weight loss plan so that you’re doing it for maintenance. If you weight yourself daily during maintenance you’ll notice little fluctuations. If you notice little fluctuations you can look back on that 24 hours and figure out, “What did I do differently during those 24 hours that would affect today’s weight?” Typically there is going to be something. You’ll be able to figure that out a lot easier if you’re weighing yourself routinely (daily). If you try to look back a week’s period of time you really have no idea what you did differently. So, this is the reason you want to weigh yourself routinely so you can have those little fluctuations under control. Maintenance, as I mentioned, is harder than weight loss. It’s easier to make little modifications by looking back over the past 24 hours to figure out what you did differently and then modify what you’re doing. You can change that fairly easily. So that’s why you should weigh yourself daily. It’s so that you can be in the habit of doing it for maintenance. Stop in anytime to check your BCA – and don’t forget to add those pounds to the total on our home page! This entry was posted in Weight Loss Tips for Success and tagged accountability, achievement, bariatric, bca, body composition, CFWLS, daily weight fluctuation, Dr. Thomas Clark, food choices, goals, Lean body mass, motivation, patient support, success, tips, weigh in routine, weight loss on October 2, 2017 by CFWLS. Should you weigh yourself routinely or not? You’ll see things all over the map like “You should never weigh yourself” or “You should just go with how you feel” or “If you feel good, you’re good.” There are a lot of questions out there and I’m going to give you my thought on that whole issue about weighing. Weighing is the best monitor we have as far as keeping track of your weight and overall health. Weighing is a good way to look at health because when our weight is stable, we tend to be in stable health. When our weight is changing very quickly one way or the other, potentially there can be changes in health. In a weight loss program we’re obviously trying to lose weight. So, subsequently then we want to keep track of these things. Should your weigh in routine be once a week, twice a week, should we step on the scale whenever?? I encourage people to weigh themselves daily and you should weigh yourselves early in the morning. If you forget to weigh yourself early in the morning, don’t bother. Wait until the next day. It should be routine weighing. Why do I say that? Many of the patients I see are very sensitive to carbohydrates. As we’ve talked about many times in the past, carbohydrates influence insulin level. Insulin is one of the hormones that makes you retain water. It also makes you store fat. If insulin levels go up, you store fat, but the first thing you do is retain water. Subsequently, weight jumps up. So, it’s actually a good monitor to weigh yourself. Many of our patients are sensitive to carbohydrates and even a little carbohydrate causes a significant weight increase. If your weigh in routine is daily, it’s relatively easy to look back on the past 24 hours and see what you did differently. Where did you stray? What happened over the last 24 hours? If your weigh in routine is once a week, it’s hard to look back at a whole week period of time and see what happened differently. It seems like we’re doing the same things week-to-week. But day-to-day it’s much easier to monitor your weight and notice little changes. And, little changes will matter. If you’re sensitive to carbohydrates, one bad day can cause your weight to jump up significantly. If you wait a week to find that out, you’ll never really know what happened. This goes along with the journaling discussion we’ve had as well. So, write things down and weigh yourself routinely. I typically like people to weigh themselves in the morning. Early in the morning is your most accurate weight. As we progress throughout the day, we typically will retain some fluid and weight will go up. Make it a part of the morning routine. Get up, weigh yourself, and get on with your day. 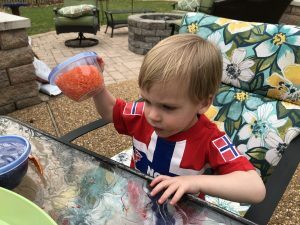 If you’re someone who is going to obsess about the numbers, understand that the weight does fluctuate day-to-day even when you’re doing all the right things. Don’t obsess about that number. What I encourage people to do is to look at what’s happened on average over the past 7 days. But don’t obsess about the numbers because there are lots of reasons to have fluid shifts and fluctuations up and down, and it may not be something you ate the previous day. It could be that you’re close to your cycle (women). It could be blood pressure or salt issues. There are lots of little things that will play into that. The biggest thing tends to be the carbohydrate sensitivity. Overall, I recommend you weigh yourself daily early in the morning. If you forget, wait until the next morning. Don’t forget to post your weight losses on the Home Page of the website! 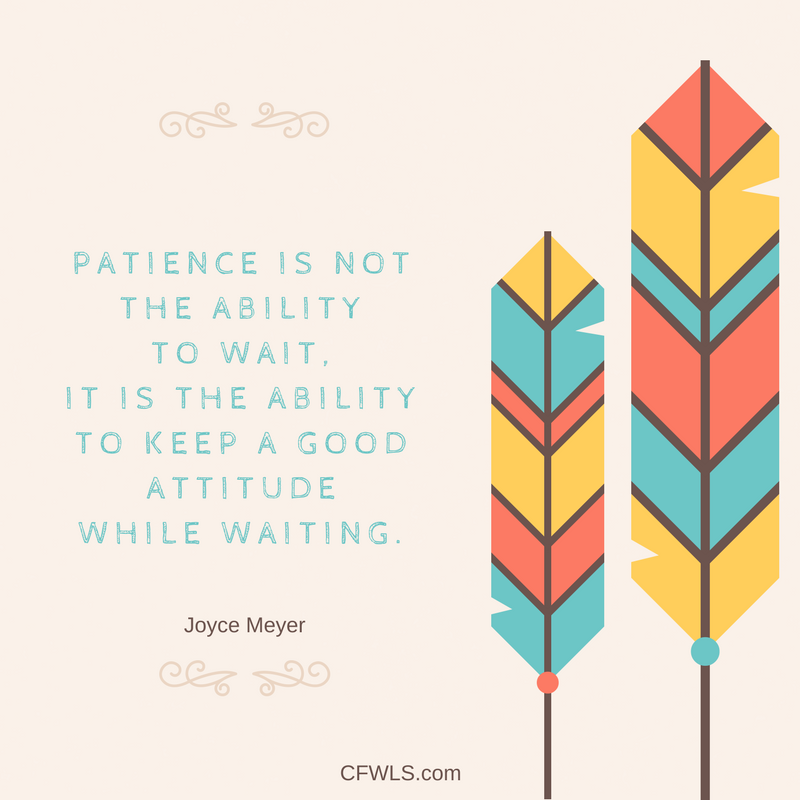 This entry was posted in Weight Loss Tips for Success and tagged achievement, bmi, CFWLS, Dr. Thomas Clark, exercise, food choices, journaling, low carb, motivation, patient support, self image, success, weigh in routine, weight loss on September 25, 2017 by CFWLS. We talked recently about heart monitors and how they’re helpful in determining how well you’re doing with your fitness routine. You’re often taught to exercise in the “fat burning zone” to maximize the utilization of fat. We want to burn calories and fat. That fat burning zone is where you burn the highest percentage of fat as your energy source during your exercise. It’s usually at about 60-70% of your maximum heart rate. We talked last time about maximum heart rate (220-your age). That’s a good estimate. We’re then taking 60-70% of that maximum heart rate. It’s somewhere between 108-126 if you’re 40 years old. In theory, that’s your fat burning zone. That means that the highest percentage of calories burned is actually coming from fat. The problem is that you’re not actually burning very many calories. Most of the calories you’re burning are coming from fat, but the issue is that you’re not burning that many calories. What you really want to do is bump up the intensity. If you bump up the intensity, you’re burning a lot more calories. As you’re burning a lot more calories, your body can’t use fat quite as efficiently and so you’re burning more calories from carbohydrate. Is there something wrong with that? Absolutely not! If you’re burning more calories from carbohydrate, what you’re doing is decreasing your carbohydrate stores. We can store carbohydrate in our muscles. If we start decreasing the carbohydrate stores, you can actually replace that carbohydrate. For example, you can’t put more gasoline into your car’s gas tank until your burn the gas off. There’s only so much carbohydrate that will fit into your muscles. If you don’t actually decrease the amount that’s in the muscle, then you can’t replace it. You want to burn off that carbohydrate that’s in the muscles. If you burn that off, then you can actually put more in. That’s how we can smooth over blood sugar swings. Then, you can get a little leeway on your carbohydrates. There are two reasons why the fat burning zone doesn’t work really well. The first is you’re not burning that many calories. If you bump up the intensity, you’re going to burn a lot more calories. Number two, you want to use some of the carbohydrates stores because you want to be able to replace those stores. When you’re exercising, use a heart rate monitor and bump up the heart rate to higher than the fat burning zone. If you’re just starting an exercise program, you can’t just jump right into that. But if you’ve been in exercise for a while you can go into that higher intensity as your fitness level increases. That’s where you burn the most calories and you get the most after burn as well. That’s burning calories long after you’ve finished exercising. This entry was posted in Weight Loss Fitness, Weight Loss Tips for Success and tagged calorie burn, CFWLS, Dr. Thomas Clark, exercise intensity, fat burn, fat burning, fat burning zone, fitness, HIIT, success, weight loss exercise on September 18, 2017 by CFWLS.